Nothing says “party” like chips and dip! 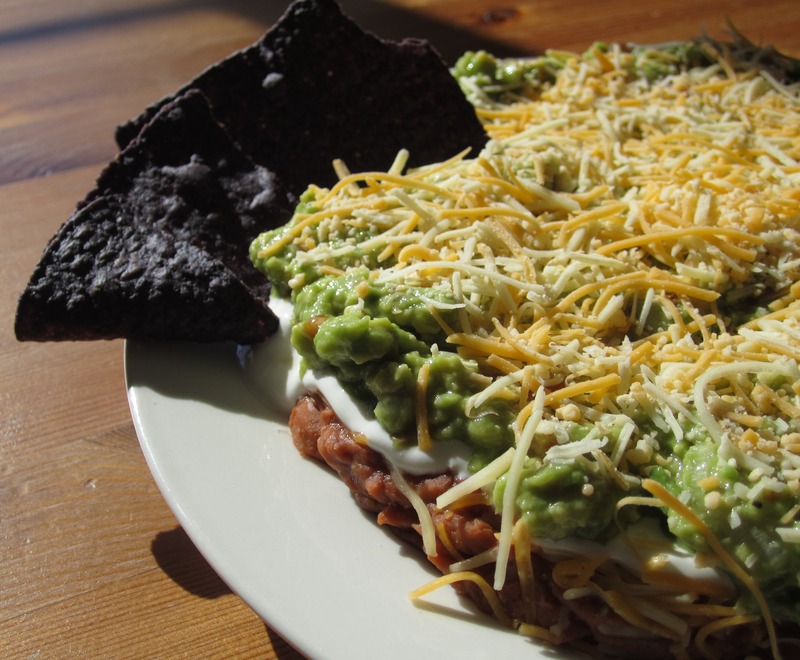 This five layer dip has a combination of all the essentials, guaranteed to be a hit with everyone. I had eaten about half the plate before my husband even got to try it! Using a small pan or skillet over low to medium heat, cook the refried beans until heated through. Spread the beans on the bottom of a plate or platter. Top with half of the shredded cheese mixture. Spread the sour cream over the layer of cheese, being careful not to disturb the layers. Spread the guacamole over the layer of sour cream. Sprinkle the remainder of the shredded cheese over the guacamole. Serve immediately with a side of tortilla chips. Enjoy! Chili can be a very debatable subject among aficionados. Beef or pork? Beans or bean-less? Green or red? I know several people who claim theirs is the best. I certainly don’t claim to make the best, but I sure do make some darn good chili! Chili originated in the late 1800’s in San Antonio, Texas. Hispanic women would gather in public places and sell bowls of chili to passersby. Cattle were cheap and plentiful in San Antonio, so chili was often made with beef. As the years went by, chili parlors opened up throughout Texas. Soon, the craze expanded to nearby states. Since beef wasn’t as abundant or inexpensive in other regions of the United States, people started adding beans to their chili, to act as a “filler.” So, as it turns out, the original chili did NOT include beans. Well, I have nothing against beans, so they make an appearance in my chili. More fiber, right? For this recipe, I use a blend of ground beef and pork. I asked my brother, a butcher, to grind some chuck. I prefer chuck because it has a great balance of meat and fat. Fat is essential for lots of flavor. For ground pork, I use boneless pork loin. The combination of beef and pork, along with some smoky bacon, makes for a hearty, satisfying chili. Cook bacon in a 6 to 8 quart heavy pot over medium to high heat, until crisp. Using a slotted spoon, remove bacon from pot and set aside. Leave the bacon fat in the pot! This is valuable stuff! Add the diced onion and green pepper to the pot, using the bacon fat to cook the vegetables until tender, about 5 to 8 minutes. Remove the vegetables and set aside. If the vegetables have absorbed all the bacon fat, add some olive oil to the bottom of the pot. Add the ground pork and beef and sauté until brown. Return the onion and bell pepper to the pot. Add garlic, cumin, oregano, cayenne pepper, and smoked paprika. Cook for about a minute. Return the bacon to the pot. Add the tomato paste to the mixture, making sure to blend it well throughout the meat. Add the crushed tomatoes, coffee, and water, and bring to a simmer. Stir in the kidney beans. 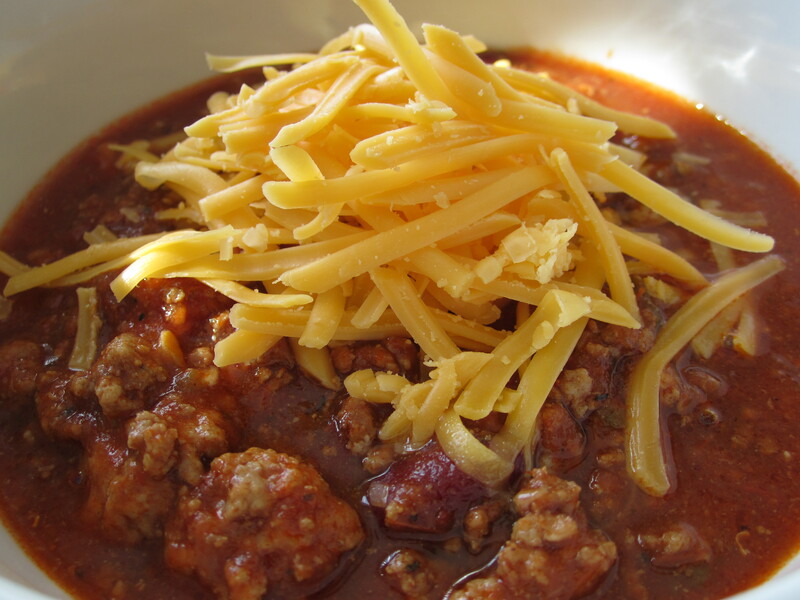 Cook the chili for about 2 to 2 ½ hours, stirring occasionally. Ladle chili into bowls and top with shredded cheddar cheese before serving. Enjoy! Believe it or not, I don’t like meat in my quesadillas. No chicken. No beef. Just cheese. Ooey, gooey, stringy cheese. Quesadillas are the perfect anytime snack. Heck, you can even make it a meal. They’re definitely perfect for game day, like today. I like a combination of different cheeses in mine – extra sharp cheddar for some bite, mozzarella for that smooth taste and cheesy stringiness (see above), and habanero cheese, for that essential kick in the taste buds. Before I go forward, I need to write some more about Cabot’s Hot Habanero Cheddar Cheese, my new-found love. I came across it in the imported cheese section of my local supermarket, while I was searching for Cabot’s Chipotle Cheddar. The chipotle cheese was nowhere to be found, and I stood there for a moment, contemplating if I was bold enough to give the habanero cheese a try. I decided to buy it. Later that evening, I cracked open a bottle of wine (Cannonball, the hubby’s favorite), and placed a few slices of cheese onto a plate. Immediately after my first bite, my tongue was on fire. I felt an insane amount of heat permeating my taste buds. My eyes watered a bit. I drank a sip of wine and waited for the heat to die down. Then, I went back for more cheese. I was obviously insane. This cheese brought a five alarm fire to my mouth, yet I wanted more. I was hooked. Cabot’s Hot Habanero Cheddar is now a regular in my fridge. I shred a little to top my mac and cheese, slice it for my burgers, and pair it with crackers for a simple snack. Yum. Back the quesadilla. Even though my sister isn’t a fan of habanero cheese (or anything too spicy, for that matter), this recipe is for her. As a kid, my sister ate two things: pizza and quesadillas. When we had a family night out, if one of these two things was on the restaurant menu, she’d order it. If it wasn’t – watch out! 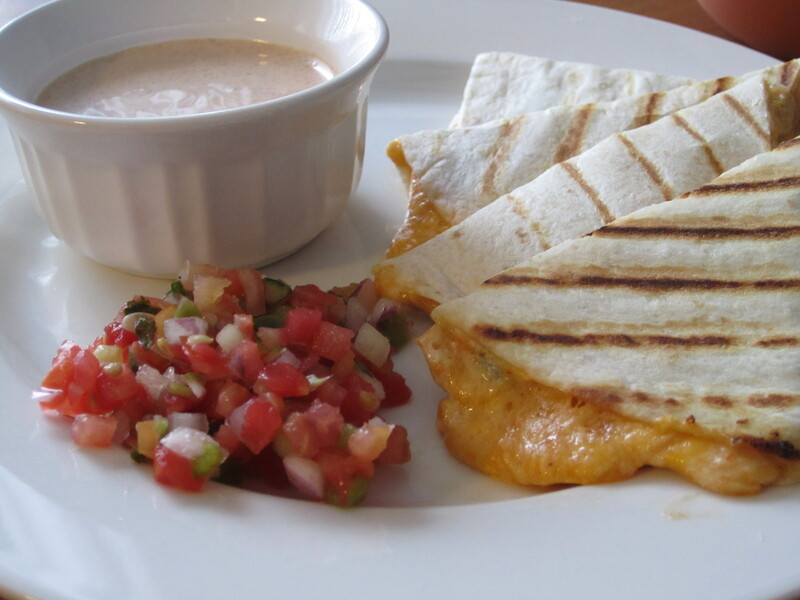 So, Arelis, lover of ooey, gooey, cheesy quesadillas, this one’s for you! First, make the sauce. Combine all the ingredients and mix well. If making the sauce ahead of time, be sure to refrigerate. Before you assemble the quesadillas, heat a large skillet or grill pan over medium high heat. I prefer my Cusinart Grill Pan, because it gives the quesadillas nice grill marks. If you don’t have a grill pan, a large skillet will work just fine. Combine all the cheeses into a bowl. Spread some of the sauce onto a flour tortilla. Make sure to keep it within about an inch of the edge of the tortilla. You don’t want the sauce to ooze out when your press down on your quesadillas. On one side of the tortilla, sprinkle some of your cheese blend. Make sure it’s spread out evenly. You want each bite to be filled with some cheesy goodness. Fold the tortilla over. Place the quesadilla on the grill pan (or skillet, if that’s what you’re using) and let sit for 3 to 4 minutes before flipping. When you flip over the quesadilla, press on it lightly with a spatula to ensure the cheese “glues” the tortilla shell in place. While the quesadilla is achieving that spectacular level of cheesiness, assemble the remainder of your quesadillas. Once all the quesadillas are cooked, allow to cool for about one minute before cutting into triangles. Serve with the remainder of the sauce on the side and some pico de gallo (optional). Enjoy! I didn’t know what “bolognese” was until fairly recently. Sure, I had heard the term plenty of times, but I never knew “bolognese” was just a fancy name for a meat-based sauce for pasta. Turns out, I had spaghetti bolognese quite often as a kid. Well, kind of. It was more like, “let me open this jar of Ragu over some pasta so I can say I cooked you kids some dinner.” Not a big difference, right? Usually, I don’t go for recipes that involve me slaving in the kitchen for hours at a time. Sure, I like a bit of a challenge, but I don’t want a backache to overshadow the victory of my latest kitchen adventure. When I came across Anne Burrell’s Pasta Bolognese recipe, the first thing I noticed was the four and a half hours of cooking time. Despite that craziness, I still went forward with making it. Hey, at least I could say I’ve made bolognese sauce from scratch. And, because the idea of cooking a meat sauce for almost five hours wasn’t daunting enough, I decided on a side of roasted asparagus with poached egg, and garlic bread. From scratch. Oh, and did I mention I had never made Italian bread before? In a food processor, puree onion, carrots, celery, and garlic into a coarse paste. In a large pan over medium heat, coat pan with oil. Add the pureed vegetables and season with salt. Cook the vegetables until all the water has evaporated and they become nice and brown, stirring frequently, about 15 to 20 minutes. Have some patience! Add the ground beef and season again generously with salt and pepper. Brown the beef and let cook about 15 to 20 minutes. Add the crushed tomatoes and tomato paste and cook for another 5 minutes. Add the red wine. Cook until the wine has reduced by half, about 10 to 15 minutes. Add water to the pan until the water is about 1 inch above the meat. Toss in the bay leaves and the bundle of thyme and stir to combine everything. Bring to a boil and reduce to a simmer, stirring occasionally. Simmer for 3 1/2 to 4 hours. If your sauce reduces too much, add some water. Don’t be afraid to add water, you can always cook it out. As your sauce simmers, be sure to taste it and season it accordingly. During the last 30 minutes of cooking, bring a large pot of water to a boil over high heat to cook the spaghetti. Remember to salt the water! When the water is at a rolling boil add the spaghetti and cook for 1 minute less than it calls for on the package. Reserve 1/2 cup of the pasta cooking water. While the pasta is cooking remove 1/2 of the meat sauce from the pot and set aside. Drain the pasta and add to the pot with the remaining meat sauce. Stir the pasta to coat with the sauce. Add the reserved pasta cooking water and cook the pasta and sauce together over a medium heat until the water has reduced. Turn off the heat grate some Pecorino Romano over the entire pot of pasta. Toss vigorously. 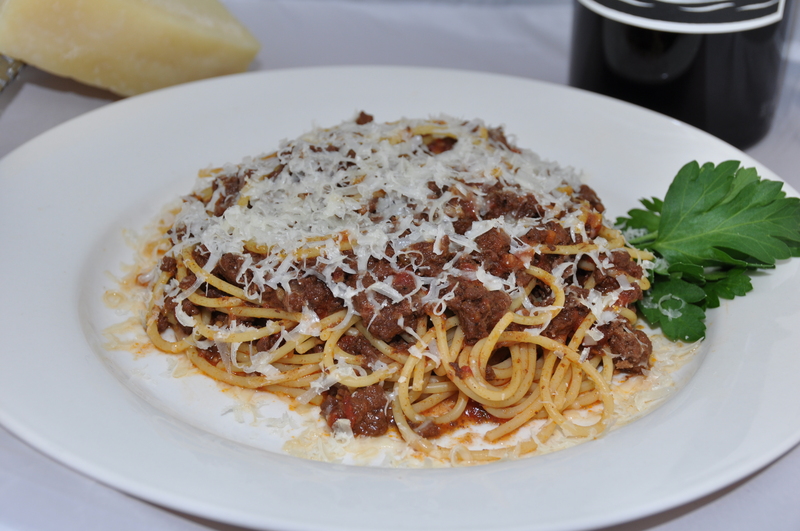 Serve the pasta and top each dish with some more Pecorino Romano. Serve immediately. Fill a large saucepan two-thirds of the way with water. Add the white vinegar and bring to a boil. Holding the tip and stem of each asparagus spear, snap the asparagus where it will naturally break. Discard the ends. Toss the asparagus with some olive oil and sprinkle some salt over them. Place the asparagus in the oven and roast for 15 minutes. Reduce the heat on the water until the bubbles in the water have subsided. Gently crack and drop the eggs into the water. Cook the eggs for 3 to 4 minutes. When done, the whites will be cooked through and the yolks will be warm but still liquid. Using a slotted spoon, carefully remove the eggs from the saucepan and blot the bottom of the spoon on a paper towel before plating the egg. Remove the asparagus from the oven. 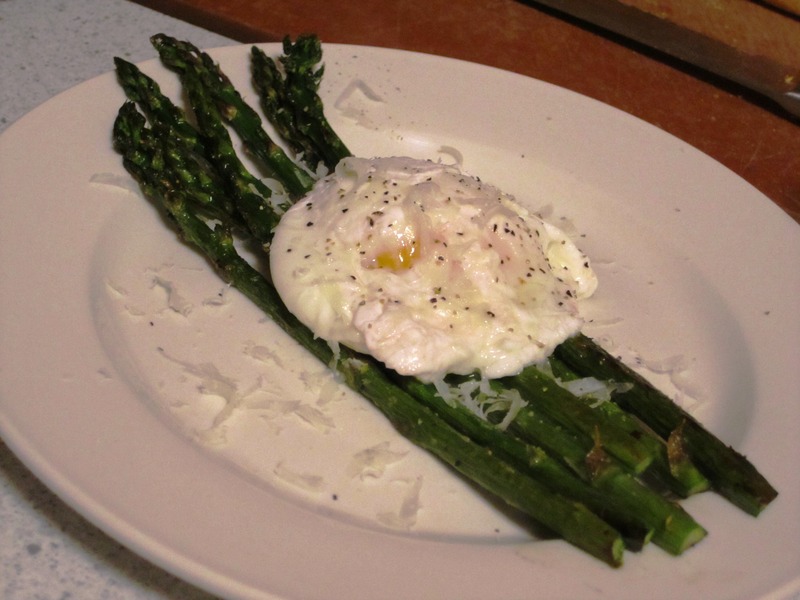 Divide the roasted asparagus spears on plates and top each set of asparagus with a poached egg. Sprinkle with the grated Parmigiano and a bit of pepper. Serve with some soft Italian bread, to sop up the yolk. Place the water and yeast into the bowl of an electric mixer and allow the yeast to bloom for about 5 minutes. Add the flour and sugar to the water and mix until a dough begins to form. Drizzle the oil and salt into the dough and continue to mix for about 8 to 10 minutes, or until a smooth, firm dough is formed. Wrap the bowl in plastic wrap and let the dough sit until doubled in size, about an hour and a half. Deflate the dough and turn it out onto a lightly floured surface. Form dough into two loaves. Place the loaves on a cutting board generously sprinkled with cornmeal. Cover the loaves with a damp cloth and let rise, until doubled in volume about 40 minutes. Meanwhile, preheat oven to 375 degrees F.
Add the garlic and seasonings to the softened butter and blend well. 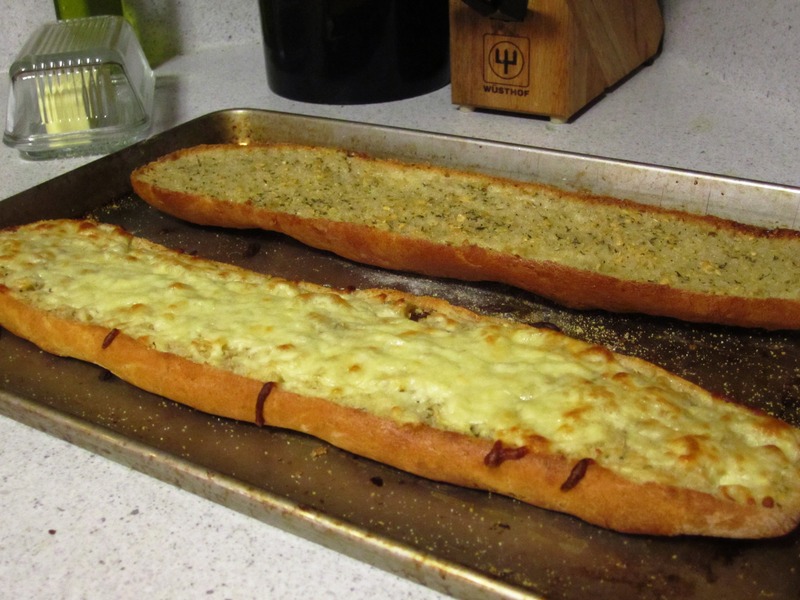 Slice the bread in half, horizontally. Spread the butter mixture on each half. Sprinkle with cheese, if desired. Place the bread on a baking sheet and bake for 10 to 12 minutes. Enjoy! After serving up this meal, I feel like I’ve conquered a culinary mountain. Ok, maybe a large hill. Still, this felt greatly rewarding and satisfying. John proclaimed it an “amazing” meal and served himself a second helping. Even Logan, my super-picky three year old, proclaimed that he LOVES mommy’s bread. Not bad, eh?